Aiming to crack UGC NET 2019 Exam? If yes, then apart from getting the deep knowledge of the subjects, there are many general queries you must know. UGC NET Frequently Asked Questions are the comprehensive source to clarify the common queries of candidates related to the exam, its criteria & procedure. 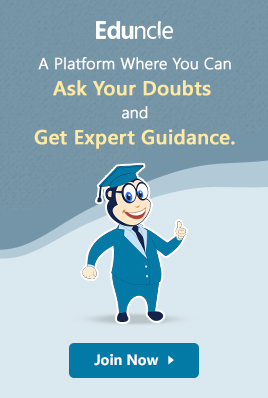 To solve your doubts, here, Eduncle team has come up with the complete guide to present all the frequently asked questions (FAQs) related to UGC NET Exam. We hope this blog will help you to understand the exam and will put some insight on the UGC NET Exam. UGC NET FAQs 2019 - Get Resolved your Queries! Question 1: What is UGC NET Exam? Answer: UGC NET is a national level test to determine the eligibility for the lectureship and the award of Junior Research Fellowship in university or colleges. UGC NET stands for University Grants Commission National Eligibility Test. Question 2: What are the benefits of qualifying UGC NET? Become an Assistant Professor/ Lecturer in any of the UGC Approved Universities. Become a Research Fellow, Project Assistant or Research Analyst in any of the prestigious organization, universities or laboratories. Apply for highly reputed Public-Sector Organizations in India. Become an author or a NET faculty. Be a guest faculty in universities and institutes. Work as a lab assistant. Become a consultant or a counsellor etc. You can check the future scope after qualifying the NET Exam in detail at- UGC NET Career Scope. Crack UGC NET June 2019 Exam with the Experts Designed Study Material, Notes & Sample Papers. Download ALL for FREE! Question 3: Is Aadhaar mandatory for UGC NET June 2019? Answer: The Aadhaar number is only one of the types of identification and is not mandatory. Aspirants can also use Ration Card number, Passport number, Bank Account number or any other valid Government identity number. Question 4: Am I eligible for UGC NET after a PG diploma? Answer: If you have completed your PG Diploma from a recognized university or institution, you are eligible. Question 5: What is the age limit to apply for UGC NET Exam? Answer: As per the UGC NET Eligibility, there is no age limit for the assistant professor while the age of the candidates for the JRF should not exceed 30 years. Question 6: Will distance education be acceptable for UGC NET? Answer: Yes, distance education is accepted for the UGC NET Exam only if you enrolled in UGC approved or recognized institute or university. Question 7: What is the syllabus for UGC NET? Answer: The UGC NET Syllabus is different for each subject. After the changes made in the exam pattern, two papers will be included in the NET Exam. You can check the complete syllabus for UGC NET for all the subjects by referring our blog: UGC NET Syllabus. Question 8: How to get a UGC NET Certificate after I clear the exam? Answer: The candidates who have cleared the NTA NET Exam can check the step by step procedure to get their Certificates. The instructions are given in the following blog - UGC NET e-Certificate Download Procedure. The UGC- NET Bureau will issue the e-certificates to qualified candidate. So in case of any doubt, the qualified candidates may contact Head, UGC NET Bureau, University of Delhi, South Campus, Benito Juarez Marg, New Delhi, Pin Code-110021, Phone No. (011-24116316, 24115416, 24115419). If you find any difficulty to download the e-certificate, you can drop your queries in the comment section. Our Expert team will help you with the best possible solution. Question 9: Are there negative markings in the UGC NET Exam? Answer: No, there is no negative marking in the UGC NET Exam. Question 10: How to download the NTA UGC admit card 2019? 1. Go to the official site and click on the Download Admit Card link. 2. Enter your application number and password correctly. 3. Click on the submit button to download your admit card. 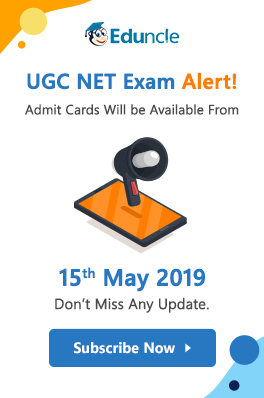 Note: Visit our blog UGC NET Admit Card 2019 for more details and download your admit card before the exam. The admit cards will not be sent to the candidates personally by post. Question 11: What is the expected cutoff of NTA UGC NET exam? Answer: Candidates need to required minimum marks in UGC NET Paper-1 and paper-2 to be considered for the award of the JRF and assistant professor eligibility. After the completion of the exam, the experts predict the cutoff marks based on the previous years’ trends and difficulty level of question paper. Eduncle.com has also made it available for candidates to check the declared cutoff marks & results for UGC NET. Please visit the following link – UGC NET Result and Cut Off. Question 12: How to prepare for UGC NET Exam? Answer: #AskEduncle. If you need any assistance in UGC NET Preparation, register here at eduncle. Once you're done with the registration process, Eduncle Counsellors will call you and help you with the best guidance for your exam preparation. Want more guidance in UGC NET Preparation? Register Here to Get FREE Assistance from UGC NET Experts. Question 13: Where will the UGC NET qualified candidates get the e-Certificate? Answer: NTA only conducts the UGC NET Exam and declares the result. The UGC NET e-Certificates are issued by UGC NET Bureau. Candidates who qualify the exam need to contact Head, UGC NET Bureau, University of Delhi, South Campus, Benito Juarez Marg, New Delhi, Pin Code – 110021. Question 14: What's the best book/guide to prepare for UGC-NET Exam? Answer: The UGC NET Exam is being conducted within 84 subjects. For the best UGC NET study material, sample papers, mock test and PDF notes, please visit: UGC NET Study Material & Preparation Books. Question 15: What are the duration/timings of UGC-NET 2019? Answer: The duration of UGC NET Exam is 3 Hours for both Papers. It is essential for the candidates to clear both the Papers to be known as a UGC NET qualified candidate. Here you can check the complete UGC NET Exam Pattern. Question 16: What is the difference between NTA UGC NET and CSIR UGC NET? Answer: The Main difference between CSIR NET & UGC NET is that CSIR NET is conducted for the science stream candidates in five subjects while the UGC NET Exam is conducted for arts, commerce and other streams for more than 80 subjects. There are differences in paper pattern, eligibility, career scope and other differences that you can check here: UGC NET Vs CSIR NET: What is the difference between these two? Question 17: How long will the result/award of UGC-NET 2019 be valid? Answer: For Junior Research Fellowship: The validity period of the offer is three years w.e.f the date of issue of JRF Award letter. In case of candidate who has already joined M.Phil. /Ph.D., the date of commencement of Fellowship shall be from the date of declaration. Question 18: Can an art student apply for the JRF NET? Answer: Yes, an arts student can apply for the related subjects in the UGC NET & JRF. Question 19: What is the mode of the UGC NET Exam? Answer: The UGC NET Exam will be conducted in Computer Based Mode (online) only. Question 20: What is the salary of a UGC NET qualified person? Answer: After qualifying the UGC NET Exam, the assistant professor gets the salary of around INR 30000-45000 per month while the candidates, who applied for JRF get INR 25000 stipend. Get Latest UGC NET Notification & Updates through SMS! Subscribe Here for FREE! If you wish to ask more queries regarding the NET Exam, kindly post your message in the comment section below. Stay connected with us on our YouTube Channel and Facebook to keep yourself updated with the latest information about the UGC NET Exam. Sir, I scored 54.8% in my Mcom results Can i apply for UGC NET exam? Hi. I have completed my mcom. Can I appear in management stream instead of commerce? Please reply. I have done my masters in strategic public relations from university of Sydney and a post graduate diploma from Xavier institute of communication , Mumbai. Am I eligible to apply for the ugc net in mass communication? Hello... I have cleared my msc first year this year..and now I m in msc final year..if my net is cleared .is it valid or not? Or net certificate is valid after post graduation only.